Venezuelan President Nicolas Maduro has urged the US to discuss “peace and sovereignty” in a high level commission mediated by the Union of South American Nations (UNASUR). Nicolas Maduro also asked President Barack Obama not to heed US factions that he says want to kill him. Venezuela blames the US for the anti-government protests that have left 28 people dead in the past month. The US says Venezuela is using it as a scapegoat for its internal problems. Earlier, thousands of government supporters marched through the Venezuelan capital, Caracas, to thank the country’s security forces for their policing of the recent unrest. 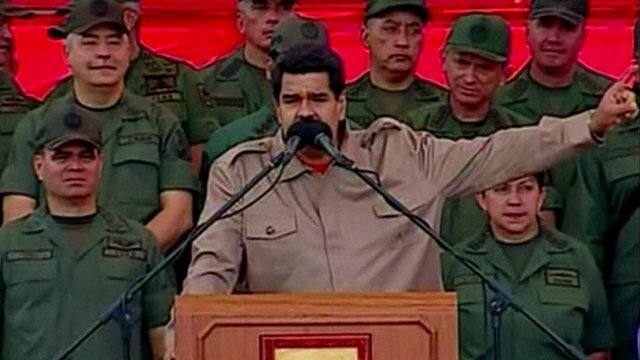 Nicolas Maduro and several military leaders held speeches praising the “civic-military” partnership. The president also proposed the creation of a “high-level commission” to discuss “peace and respect to the sovereignty” in Venezuela. Nicolas Maduro said he wanted the head of the National Assembly, Diosdado Cabello, to negotiate with a “high-level officer” of the US administration under the auspices of UNASUR. “President Obama: give peace, and respect, a chance and let’s set the foundation for a new type of relations between the US, Venezuela and if possible, Latin America and the Caribbean,” Nicolas Maduro told the crowd in a speech broadcast on radio and TV. He also warned Barack Obama against agreeing to alleged plans to kill him, put forward by “extremists” in the US administration. “It would be the worst mistake in your life to authorize the assassination of President Nicolas Maduro and fill [Venezuela] with violence,” he told the crowd, adding he was a “humble president and bus driver” who like Barack Obama also had “African grandparents”. Venezuela’s opposition has called for further protests on Sunday against “Cuban repression” in the country and criticized the government’s march. “We know soldiers and officials are against this act ordered by Cuba,” Maria Corina Machado, an opposition leader, wrote on Twitter. The opposition says it will continue to protest against Venezuela’s high inflation, food shortages and violence levels until there is a change of government.